How Did This Lamborghini Huracan Get Crushed Under A Honda Civic? Luckily, there were no injuries as a result of this bizarre accident. Well, this is an image that can’t be unseen. Yes, that is a wedged underneath a parked Honda Civic. This unusual accident happened in Chicago last week, but it wasn’t the result of a poor parking job by the Honda Civic driver. 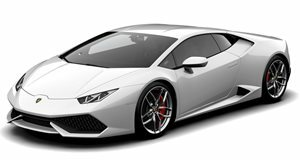 According to , the couple were on their way to dinner in the Huracan when another car slammed into the back of the supercar. The driver, Dmitry Richie, claims he then made the mistake of stepping on the gas instead of the brake after the impact, causing the Huracan to crash into the parked Civic. Due to the shape of the Lamborghini, the hatchback ended up wedged on top of the Italian supercar. After the impact, Richie told CBS Local that “gas started leaking and we were just afraid the car could catch fire.” Fortunately, the car didn’t burst into flames, and there were no injuries during the crash. It’s a testament to the design of the roofless Huracan that the occupants were protected during the crash. In this case, the car’s wedged shape also probably reduced the risk of injury, as the Lamborghini went underneath the Civic instead of absorbing the impact. You can also only imagine the reaction of the Civic owner when they returned to find their car wasn’t parked the way they left it. Sadly, it looks like the $230,000 Lamborghini was totalled in the accident. “There’s no way for me to fix it,” Richie said while assessing the damage. They should have no problem affording a replacement however, as CBS reported the couple planned to go shopping for their next car just a few days after the accident. Sadly, this isn’t the only Lamborghini Huracan reduced to ruin recently. The same week as this crash, a after a negligent minivan driver left the fuel pump in their filler cap, which sprayed gasoline over the supercar’s hot engine bay causing it to go up in flames.